A jacket is short coat, worn by both men and women. 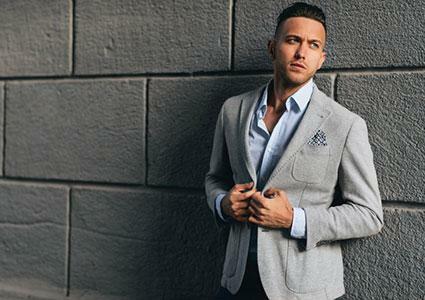 Apart from the suit, the jacket is one of the most important pieces in a man's wardrobe. If cut and styled well, and if made in a fairly neutral color palette, this versatile piece of outerwear is suitable for both formal and leisure activities. A jacket should never be exaggerated in the shoulder or tight-fitting in the body, but cut proportionately to a man's height and width in single- or double-breasted versions, with notched lapels or Nehru collar revers. There are countless styles and shapes of jackets through history, but each fits neatly into formal and semiformal styles. In April 1857 the women's magazine Corriere delle dame announced the arrival of the jacket (a shortened version of the morning coat with shorter jacket skirts), a style that would go on to become an essential item for both men's and women's wardrobes. The Adam Magazine stated in its July 1935 issue "The jacket, a type of coat that is neither tailcoat nor redingote, will be the general fashion in a single-breasted version with skirts that do not reach the knee." Adam went onto say how the jacket "barely covers the buttocks and is shaped like a sack." The jacket seems to have originated during the Middle Ages or early Renaissance as the jerkin, a more fitted version of the older short tunic worn by working-class men. By the early eighteenth century, the jacket became standard working dress for those employed both in agriculture as well as by servants in urban settings. From the late 1830s, fitted single-breasted lounge jackets (as opposed to more loosely cut jackets of the previous century), with darts beneath the arms, small revers, and waisted pockets became popular with middle-class men, with a double-breasted version appearing about 1862 (which would later become known as the reefer jacket). At that time the single-breasted Norfolk jacket, which buttoned high to the neck, became very fashionable, particularly for country sporting activities. But by the end of the nineteenth century, only three-buttoned styles were deemed fashionable, with the lounge jacket remaining the most popular. One version, made with silk-fronted lapels, was often worn to dinner parties and would become known simply as a dinner jacket (part of the formal suit known as a "tuxedo"). Similar styles to those worn in the nineteenth century were worn for most of the twentieth century and into the present century as well. Sports jackets are still worn with flannels, the Norfolk remains a sporting favorite, and blazers with brass buttons are popular summer attire when worn with white pants. The upper garment of a man's suit is known as a jacket, and "dinner jacket" remains an alternative term for the ensemble known as "black tie." The term "jacket" has assumed a much wider meaning. No longer simply associated with more formal styles, "jacket" has become an umbrella term for many styles, including sports jackets, Harringtons, anoraks, blazers, and even bomber jackets. Originally cut in wool, tweed, and cotton, current styles incorporate nylon, leather, suede, and hemp. See also Blazer; Coat; Outerwear; Sports Jacket; Windbreaker. Byrde, Penelope. The Male Image: Men's Fashion in England 1300-1970. London: B.T. Batsford, 1979. De Marley, Diana. Fashion for Men: An Illustrated History. London: B.T. Batsford, Ltd. 1985. Wilkins, Christobel. The Story of Occupational Costume. Poole, U.K.: Blandford Press, 1982.